* Master Roll Length = 50 yard (150ft). Actual width of roll is 11.8"
Just like the materials in the EasyWeed™ Family, EasyWeed™ Adhesive has a carrier side and a material side. 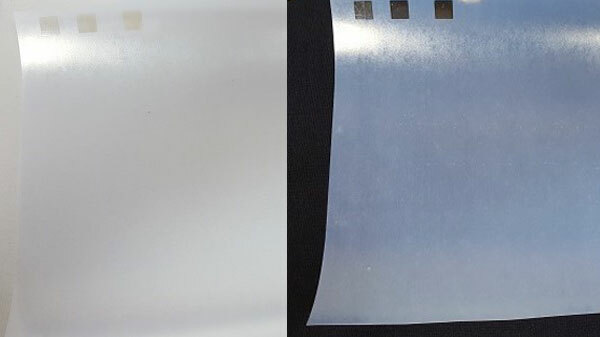 The carrier side is noticeably smoother and shinier than the material side. Now you may notice the material side looks like it doesn’t have any, well, material. That’s because it’s simply a layer of mostly transparent glue. Not just any glue though, EasyWeed™ Adhesive! EasyWeed™ Adhesive can not only be used with textile foils, it also works with fabrics and other materials that lend themselves to adhesion. 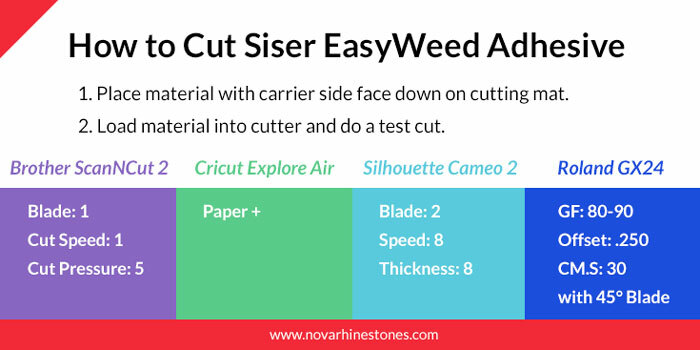 EasyWeed™ Adhesive can be cut on any vinyl cutter and requires the typical steps before cutting Siser heat transfer vinyl. Make sure to mirror your design and place the carrier side face down on the cutting mat. Then make sure you pin the image below so you can always find your cut settings! I always recommend a test cut before cutting a full design. How old your blade is will effect your blade and cut settings, so make sure your blade produces a good cut with our suggested settings or make some adjustments. When it comes to weeding EasyWeed™ Adhesive you may drive yourself crazy trying to weed it on top of a light colored surface. Instead, weed on top of a dark table or place a dark piece of paper or fabric behind the material so you can identify the cut lines. Start by weeding the outside of the material by hooking your Siser Weeder into a corner and separating the excess material from the carrier. We wouldn’t call it EasyWeed™ Adhesive for nothing. This material weeds simply like any other EasyWeed™ material! Once you can see the design of your outline, weed out any cavities in the design. When your certain it’s weeded perfectly you can prepare to heat apply! Heat Press Settings for EasyWeed™ Adhesive are: Temperature: 275°F/135°C, Pressure: Medium. Start by preheating your garment for 2-3 seconds so you have a wrinkle and moisture free area to apply to. Place the adhesive with the carrier side face up, cover with a heat transfer cover sheet, and press for 5 seconds. Leave the garment on the heat press and peel the carrier hot. You’ll notice the shiny, clear adhesive is left behind. Now you’ll add the top layer material. In this case it’s a NRD Textile Foil. Cut a piece large enough to cover your design. Place the piece on top of the EasyWeed™ Adhesive with the color side up. 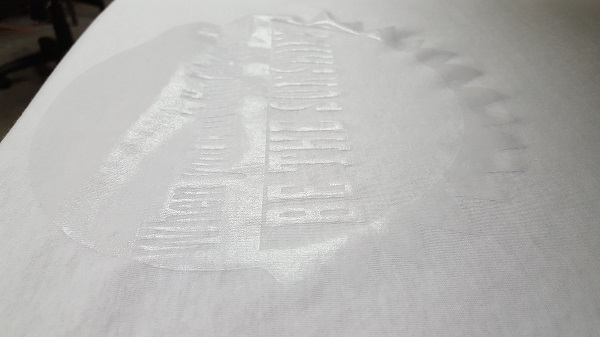 Recover with your heat transfer cover sheet and press for 10 seconds. Notice how the adhesive has gripped the foil. 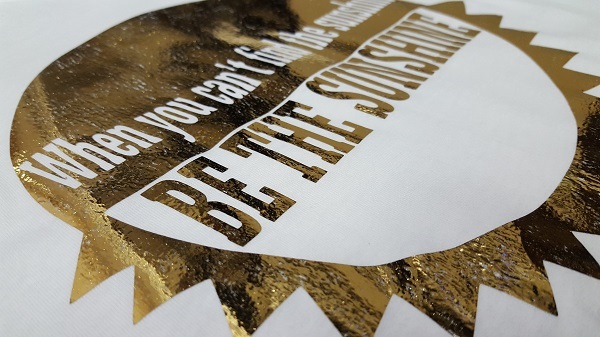 Before excitedly peeling off the foil, remove the garment from the heat press and wait until the foil is cool to the touch. Your patience will be rewarded with a shiny, super cool garment! You may notice small gaps in the foil on your garment, that’s because textile foils don’t actually offer full coverage. 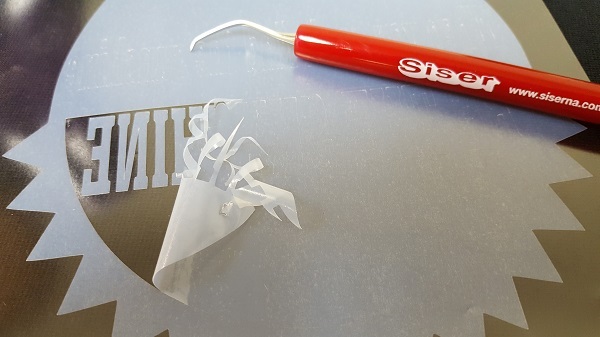 It’s normal for small pieces to get left behind on the foil sheet. 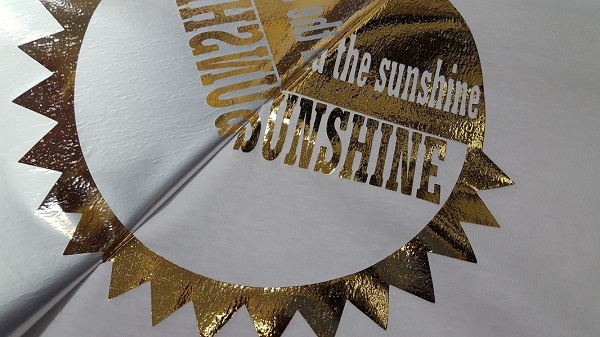 This gives the foil a bit of a distressed look that’s very popular. 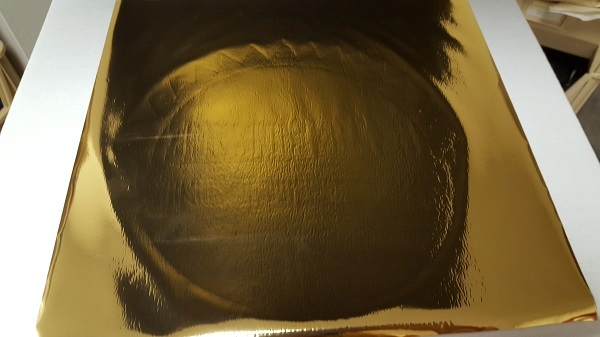 If you want an even more distressed look, crumple the foil before heat application.